In a fantastic landscape in the heart of the Eifel lies the "Sources City Gerolstein". 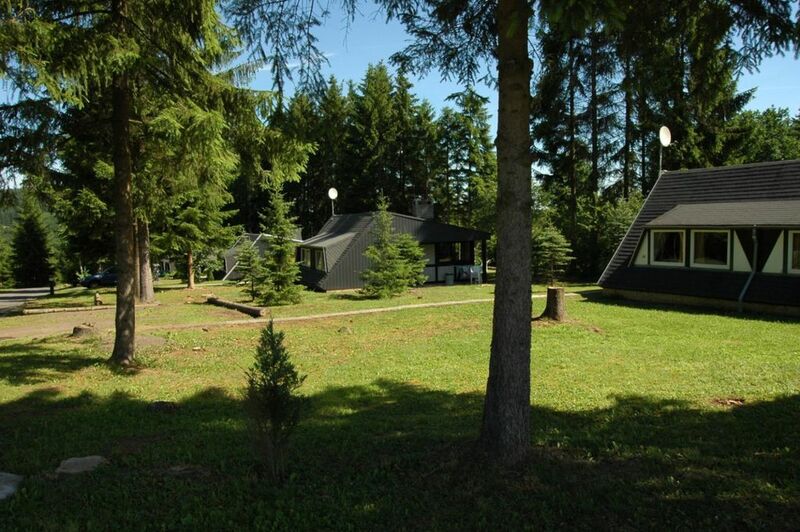 The Gerolstein-Hinterhausen holiday resort is situated in the midst of a pine forest, at an altitude of 470 meters. The Eifel Volcano provides a wonderful varied landscape of vast forests, picturesque villages, deep crater lakes and narrow river valleys (400 - 750 m). This spacious holiday bungalow is situated around a central building where you will find a restaurant offering not only delicious food but magnificent views of the Eifel landscape. Other facilities include a small indoor pool, a sauna and solarium, a tennis court, volleyball/basketball court, entertainment area, children playground, bar / cafeteria, large chess & checkers and a mini-petting zoo. There is also a laundrette with washing machines and dryers. In both summer and winter this is a great place to unwind. Furthermore, in winter you can enjoy skiing here as there is a ski-lift in the immediate vicinity (15km). This unique, spacious bungalow is furnished and can accommodate up to 6 persons. Each bungalow has a cozy living room of 30m2 which includes an open fireplace and a sitting area with a color television. The kitchen is fully-equipped and includes a coffeemaker and refrigerator as well as crockery - nothing has been left out. Furthermore, there are 3 bedrooms in the bungalow, each furnished with 2 single beds (all beds have duvets. Some bungalows have 1 bunk bed instead of 2 single beds). There is also a modern bathroom with a bathtub / shower. Outside you can enjoy wonderful views, nature, and plenty of peace and quiet on the partially covered terrace. The baby bed costs 4, 50 Euro for the weekends.